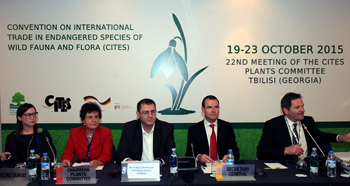 Geneva/Tbilisi, 19 October 2015 – Leading experts from across the globe are meeting in Tbilisi, Georgia, from 19 to 23 October 2015 for the 22nd meeting of the Plants Committee of the Convention on International Trade in Endangered Species of Wild Fauna and Flora (CITES). Over 160 delegates are expected to attend the meeting, including observers from Parties, intergovernmental bodies, non-governmental organizations and private businesses. Top on the agenda will be the conservation status and exploitation levels of several high- value timber and heartwood species, such as African teak, rosewoods and ebonies, as well as other economically valuable non-timber forest products such as African cherry, agarwood and sandalwood. The agenda also includes timber identification guidelines, and reviews of the conservation status and trade in species of aloe and cacti. Furthermore, the Committee will consider options for reporting on trade in artificially propagated plants; guidance on making non-detriment findings for tree species and perennial plants; and the cooperation with other biodiversity-related multilateral environmental agreements. "We are most grateful to the Government and the people of Georgia for hosting this critical meeting as we prepare for the 17th meeting of the Conference of the Parties to be held in Johannesburg, South Africa, in September 2016. Georgia offers an excellent example of the importance of our Convention for conservation as well as sustainable use and trade. 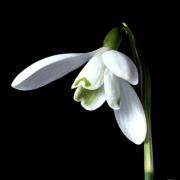 The country exports annually some 15 million wild, CITES-listed snowdrop bulbs. 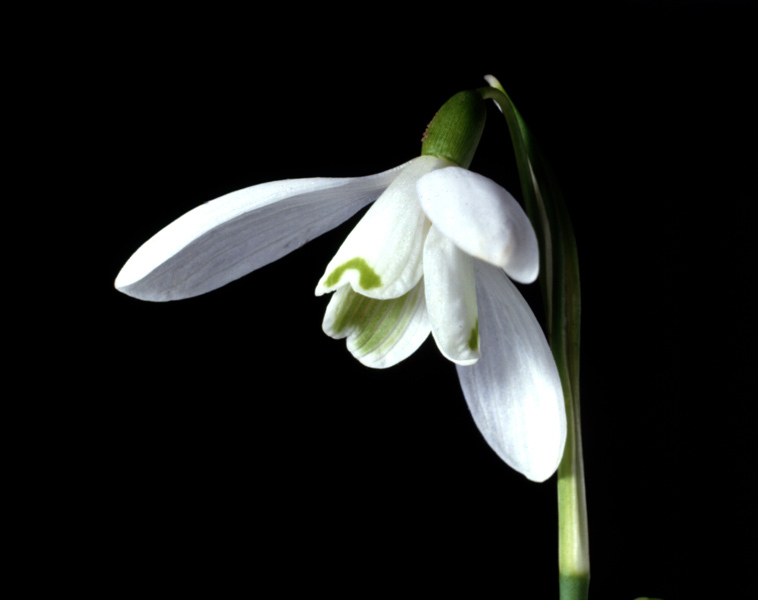 The diligent implementation of CITES by Georgia’s authorities has ensured that this trade is legal and sustainable, providing a sizeable income for local people and incentives for protecting the fragile mountain ecosystems where the bulbs are harvested.”, added Scanlon. The Plants Committee provides the technical and scientific basis for the implementation of the Convention as far as flora is concerned, ensuring that CITES decision-making on trade in plants has a sound scientific basis. The meeting of the Plants Committee will consider issues regarding a wide range of plants that are traded in the international market as wood products, musical instruments, medicines, gums, cosmetics, bulbs, ornamentals, incense or perfumes, amongst other things. African teak (Pericopsis elata), also known as Afrormosia is found in the drier parts of semi-deciduous forests in Central and West Africa. In recent years, trade in afromosia timber has soared, and levels of exploitation have been unsustainable while the species' habitat has declined. The Plants Committee will discuss and review new management systems proposed by the Democratic Republic of the Congo, and advise on best practices to trade in this valuable species while ensuring its long-term survival in the wild. Agarwood is a resin obtained from various genera of trees, which have an extensive range of distribution in central and south-East Asia. It results from the trees’ reaction to a fungus infection of the wood. Agarwood-based incenses and perfumes are used for religious, fragrance and ornament purposes in Arabic and Asian countries. One kilogram of the highest quality of agarwood can reach a value of 2 million USD on international markets. In natural forests, part of the wood of only one in twenty trees is infected with the fungus. Agarwood is usually difficult to detect. Therefore, in many trees are felt and cut up in smaller pieces just to look for the pockets that may be imbibed with the valuable resin. This causes indiscriminate cutting, which poses a serious threat to the tree species. The Plants Committee will learn about the progress made by agarwood range States to manage this resource sustainably, and consider their proposals for future actions, which may then be presented at CoP17. For more information on the 22nd meeting of the Plants Committee, please contact Liu Yuan ([email protected]) and Milena Sosa Schmidt ([email protected]). For official documents and other information, see http://cites.org/eng/com/pc/index.php. 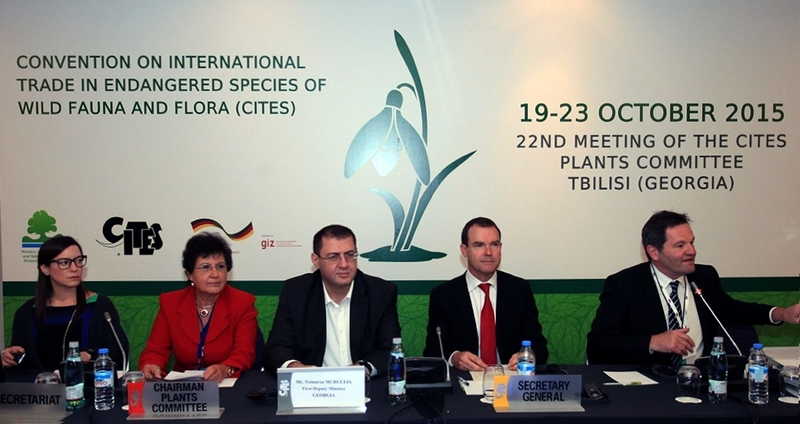 The outcomes of the 22nd meeting of the Animals Committee will be considered at the 66th meeting of the Standing Committee (Geneva, January 2016) and at the upcoming 17th meeting of the Conference of the Parties to CITES, to be held in Johannesburg, South Africa, from 24 September to 5 October 2016.